I say a fear, because I really liked the old museum it replaced. It was a gritty, no frills account of the City’s industrial heritage, laid out in the fitting carcass of ‘M Shed’ - the last of the dockside buildings – vast, and yet crammed with lumps of the past you’d expect to be long gone. A few years ago they were given a lottery grant to ‘evolve’ it into something more serious, and in 2006 the old Bristol Industrial Museum closed for its transformation. As the most loyal Bristolian ever to have come out of the Thames Valley*, I shared in the City’s sense of loss. (*Did you know Brunel was really born in Portsmouth, by the way? I learnt that at the Industrial Museum.) As the scaffolding went up and the silhouette of the building inside started to change shape, pressure mounted on the new guard to get this right, and not just from those who’d coughed up the £27 million to do it. 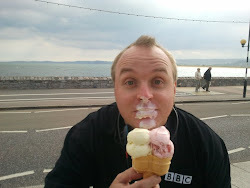 So you can see why I’ve been frightened to go. I’ll warn you now, what follows will leave the new museum’s creators and curators delighted and infuriated in equal measure. That’s good, because it’s sort of how I feel about my visit. On the one hand it was a great day out, and I know I won't be able to resist another look soon. On the other, I’m outraged. Actually it’s a good, solid name, even if I could have dreamt it up over a pint of Smiles across the road. I find the logo worrying, though – it’s too trendy. If the beauty of the name lies in the past-meets-present pun – ‘M’, the original name of the building, and ‘M’ for ‘Museum’ – then the flaw in the logo is that it doesn’t square with both aspects. It really doesn’t suit the character of the building at all; it’s all about the present. There are two galleries housing two big themes – ‘Bristol Places’ and ‘Bristol People’. Here is a big problem for M Shed; for two such enormous umbrella themes, the galleries are very small, and very, very cluttered. The modern way is not to prescribe a path around a museum (and I’d normally applaud that), but here in such a sea of random stimuli, so tightly packed together, you probably do need something at least to start you off. On entering the first gallery I suffered the kind of panic attack usually reserved for Tesco Extra. It was like Hawkins Bazaar for the historian, with every micro-turn of the head there’s something even better to see. I was faced with the delicious prospect of a Bristol Lodekka bus to my right, a cleverly designed rotating carousel of bridge designs for the Avon Gorge to my left, a marvellous aerial photograph of the city on the lino in front of me and a colourful row of plastic hot air balloons flying above my head. Perhaps the overwhelming effect is exactly what’s needed to excite new arrivals about their journey through time; but for a Bristophile with OCD like me, it was a contained sensory explosion that made me more concerned about what I might be missing than what I was taking in. It’s worth persisting. Every single thing there is worth its place. But for me, what’s not there is just as important. I soon started to look for things I remembered from the old museum: the display of old printing presses from the Evening Post; the scale model of the unique Bristol railcar; the cast aluminium Bristol ‘scroll’ from outside Brislington works. Where are they? And what about the Bristol ‘Brabazon’ aircraft engine, and the Concorde simulator? More or less the whole upper floor of Bristol Industrial Museum was given over to the story of Bristol’s rich contribution to aviation; the upper floor of M Shed is a conference area. A large part of the lower floor is a café. Factor in the shop, the meeting rooms, the foyer, the highly acclaimed toilets, and it’s no wonder the galleries are so cramped. Nor is it a wonder that 3000 items can seem so totally overwhelming when they’re squished into a third of the building. Museums must seek to recover their costs, I know. But at what cost to the whole point? Sure, casual visitors may not be so bothered about an exhaustive account of how the printing press evolved as seeing one example of how it was once done in Bristol. But whatever happened to depth and perspective? Will we find them in the coffee shop? And there are many, interesting chapters that are now totally absent, even though plenty of stuff exists to illustrate them. Why aren't we shown a Bristol lorry, once a mainstay of British haulage? I didn’t even see a picture of one. The curators have tried to make this a museum of the people, using their voices and anecdotes by way of interpretation. They’ve succeeded, and the museum screams Bristol with a proper Bristolian accent. There are handwritten postcards and quotations displayed on every wall (shame they attribute them to “Postcard Project Contributors” rather than “Bristolians”). But I wonder if they should have let some of the objects do a bit more speaking for themselves. 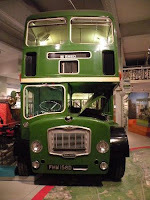 Of course, I’m bound to smart over what’s happened to the Bristol Lodekka bus. 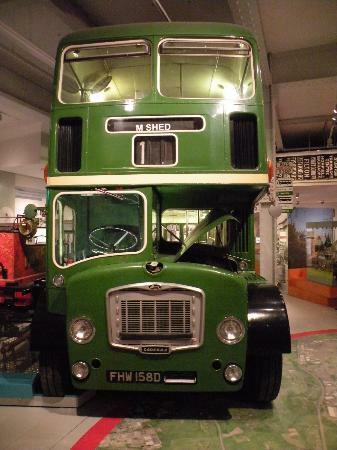 The 1966 example inherited from the Industrial Museum had always been kept in full working order, and regularly used to take Bristolians on trips around the City and beyond. It’s now completely entombed in M Shed, physically bricked into the gallery, never to leave again. They’d have to take the building down first. Where once we created new memories out of the old by actually riding on the thing, we now listen to what the Lodekka used to sound like through telephone receivers and a looped soundtrack wired into the bus. I thought that curatorial approach was itself slipping into history? Apparently not. According to the man in charge when I hassled him last year, the choice was this or no bus at all. Why?! Why?! Why?! One last moan. The staff last Saturday were, without visible exception, thoroughly miserable. Arms were folded, faces were disinterested. One girl chased me across the museum to point out smugly that flash photography wasn’t allowed inside M Shed. She’d watched me unknowingly take a flash photograph, switch off the flash, take another photograph, and another, put the camera back in its case, the case back in my bag, my bag back onto my shoulder - and then she’d started her pursuit. I apologised, smiled, shrugged at her cold stare and watched as she silently turned and marched back to her post in the crows nest. It was like Stallag Luft. I was mortified. I think the bus sums it all up for me. It’s displayed better than ever it was at the Industrial Museum, with its lights permanently switched on, some attractive video displays showing people talking about it. You can just imagine what it would have been like to ride on it up Park Street. Just imagine… But that was its old existence. In a way it’s no longer a bus. Buses are about people, they’re about bumps and lurches and overheard chatter and shared experiences. The way it’s been silenced and floodlit has somehow thrown all of that into the shadow of its new life as a museum exhibit. The project has overwhelmed the result. The present has been allowed to overwhelm the past. And yet there’s still magic in that building. Here is, I’d say, a potted history of Bristol told in an engaging and imaginative way. If that's all you want, you'll love it; the coffee's great. It was heaving, too, on the first sunny Saturday of the year. Hand on heart, I don’t ever remember the Industrial Museum being that busy, so maybe I’m completely wrong in my rather grumpy analysis of what’s been done here. For the people who never knew the Industrial Museum, who have discovered M Shed through the many thousands of pounds which have rightly been spent on marketing it, I’m sure the new experience was overwhelming in a better way.